The antics of Oklahoma U.S. Sen. Jim Inhofe when it comes to denying humankind’s contribution to global warming never cease. Has he made himself into parody for the fun of it or does he really believe in all of the stuff he argues in some of the world’s most serious forums? As you recall, last winter Inhofe brought a snowball to the Senate floor and, in a speech, referred to how unseasonably cold it was in Washington. The point was to show, as Inhofe has repeatedly argued, that the whole science underlying climate change predictions and causes is what he calls a hoax. None of this might matter except that Inhofe is chairperson of the U.S. Senate Environment and Public Works Committee. This past week, Inhofe gave the keynote address at what is called a “Climate Conference” sponsored by the conservative Heartland Institute, which gave him an award for all his diligent work in refuting the scientific evidence based on his religious views and, well, things like snowballs even though 2014 was the warmest year ever recorded on the planet. Speaking of religion, Inhofe took on Pope Francis at the conference. The pope has discussed the moral issue of global warming recently, but Inhofe wasn’t having any of it. According to media reports, Inhofe had this to say about the pope at the conference: “Everyone is going to ride the Pope now. Isn’t that wonderful. The Pope ought to stay with his job, and we’ll stay with ours.” That’s showing the pope, isn’t it? The Catholic Church has now been brought to its figurative knees. Inhofe apparently has a different view of the role of religion than the pope when it comes to global warming. Speaking of climate change on a Christian radio show, Inhofe once said, “My point is, God’s still up there. The arrogance of people to think that we, human beings, would be able to change what He is doing in the climate is to me outrageous.” So God is making this all happen. Just get out of the way, and don’t let the pope stick his nosey craw into it. 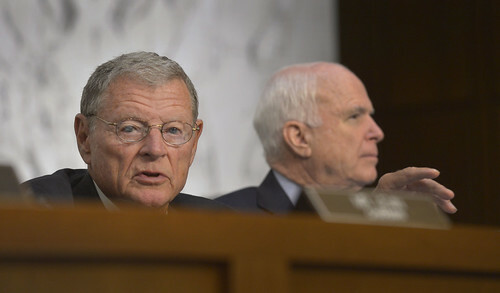 All of this might be considered funny in a type of frontier or southwestern Mark Twainy humor sense, except that Inhofe holds some real power as the chair of EPW. When he’s not telling the pope how to do his job, Inhofe, 80, is usually criticizing the Environmental Protection Agency for trying to protect our water and make sure we’re breathing clear air. (1) In his political career, Inhofe has collected more than $1.7 million in campaign contributions from the oil and gas industry. He represents an oil and gas state that is experiencing an energy boom because of hydraulic fracturing, or fracking. This has obviously influenced his political agenda. Any reporters who don’t mention these basic facts in a story about Inhofe related to global warming are not doing their job. (2) The greenhouse effect is what happens when the atmosphere absorbs radiation from the planet surface and radiates it back to the surface. The vast majority of scientists who study global warming believe the burning of fossil fuels in cars, power plants, machinery, etc., accelerates the greenhouse effect and the warming the planet, creating higher sea levels from the melting of ice caps. This threatens the very survival of coastal communities and creates more frequent and severe weather events. I know that’s not the type of information that makes headlines. It’s not like I’m telling off the pope or anything or throwing snowballs around on the U.S. Senate floor. But it does show Inhofe’s obvious motivation to advance the interests of the oil and gas industry, which makes profits off selling fossil fuels. It also gives the basic, simplistic form of what scientists are arguing about when they warn of the dangers of global warming. The answer, of course, is to double down on developing renewable energy sources, such as wind and solar power, and that’s happening in places. We also need to limit the amount of fossil fuels we do burn and eventually phase them out, which will take decades. Both those renewable sources I mentioned, as the deniers are quick to point out, have environmental impacts as well, but they are localized and don’t jeopardize the entire planet. Even local Oklahoma Gas & Electric Company is experimenting with solar power. Inhofe, as I’ve noted through the years, has brought notoriety and, yes, national embarrassment to Oklahoma because of his political stunts. He has been enabled by the corporate media here over the years, and, in particular The Oklahoman and the Tulsa World, which refrain from consistently holding him accountable. I realize voters here keep reelecting Inhofe to office, but do they realize the negative impact he has had on our state image? You wouldn’t know this by following the state’s corporate media. But consider this: The fracking boom here would have happened with or without Inhofe’s implicit boosterism of the oil and gas industry by denying humankind’s influence on climate change. Oklahoma would still be reaping the economic benefits of the oil and gas industry even if Inhofe focused his political agenda elsewhere. All he’s doing is making Oklahomans look backwards and even selfish for putting their localized economic concerns above the interests of the entire planet. I realize not everyone believes this, but Oklahoma remains relatively isolated in its own ridiculous false hubris.